Give a beautiful gift, rich with Scripture, devotionals, and Old and New Testament connections on the back of each card! This Collection includes the 12 “I AMs” spoken by Jesus from the books of John and Revelation. Frame them, give them as gifts, or use them for personal reflection, Bible study and group discussion. These high-quality art cards measure 5½ by 8½ inches and include envelopes. I Am the Resurrection and the Life is from the Resurrection Collection. This card is not available individually, but you may purchase it as a 4-pack. The cards in the 4-pack have a message on the inside (the card in the Collection is blank inside). 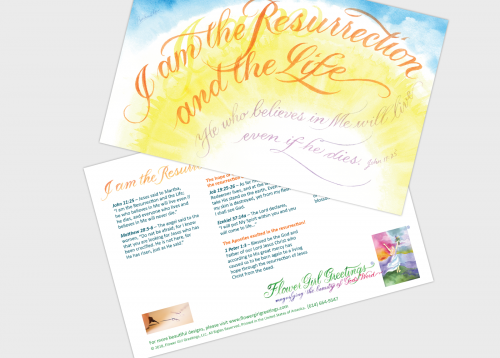 Please click here to see the front, back and inside of the I Am the Resurrection and the Life 4-Pack.